Cruising always conjures up images of days or weeks sailing through open water and docking at one fascinating port after another. But I recently discovered that a short, three to five-hour cruise could supply almost the same experience. When I lined up for the Resorts World cruise from Miami to Bimini, I expected a brief, three-hour boat ride to the Bahamian island of Bimini. But it turned into a 20-hour adventure on the ocean that I'll never forget. 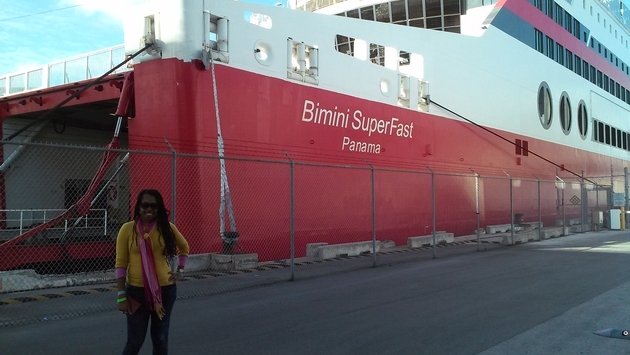 I'm generally not a fan of cruise ships since I suffer from seasickness, but I was impressed from the time I stepped aboard the bright red Bimini Super Fast. Equipped with restaurants, bars, a casino and a crew that entertained with live music and games, I quickly forgot that I was on ship that would most likely start lurching from side to side. I joined a riveting game of movie trivia and along with my crack team, trounced 11 other teams to win Resorts World T-shirts and hats. I was so into the game, sipping pina coladas and listening to a talented pop cover band, that I didn't noticed three hours had already passed. Three hours is all it takes to sail from Miami to Bimini, but there we were, still floating along. I was in the middle of eating an elegant, four-course meal of salmon, soup and wine, when the captain announced that the water was too turbulent to dock at Bimini. We would wait until the waves settled down. Okay. So that would only take a few more hours, right? Four hours later, we were still floating in the middle of the ocean. Or should I say, bobbing from side to side. I was sick, everyone around me was sick. The constant rocking of the waves had turned my quick cruise trip into an extended oceanic ordeal. The Bimini Super Fast boasts hundreds of comfortable staterooms but the travelers who were taking the round-trip cruise booked them all. I was supposed to be taking a quick jaunt to Bimini so I could explore the island. Instead, I was exploring the interior of the Bimini Superfast with a rumbly tummy. After five more hours, the crew passed out sleeping bags for the passengers who hadn't booked cabins. It was like a giant slumber party with dozens of people. We played more games, listened to music and nibbled on snacks. I dozed awhile but many passengers stayed up all night. The walked the deck, talked and played the casino games. It really was a bizarre scene with passengers roaming the ship all night and sprawled out all over chairs, tables and floors. I woke up in the same clothes that I had arrived in the previous day, feeling sticky and off balance from all the rocking. Fresh air is always a good remedy for grogginess so I headed toward the upper deck. The sun appeared in a burst of light and I instantly felt better. I strolled on deck and relaxed on a lounger. The ship was turning back to Miami, unable to risk the rocky voyage. The city skyline unfolded in yellow and pink over the water. Finally docked, the ship was a noisy mass of passengers lined up to disembark, and I was happy to step onto land. But the wonder was just beginning. 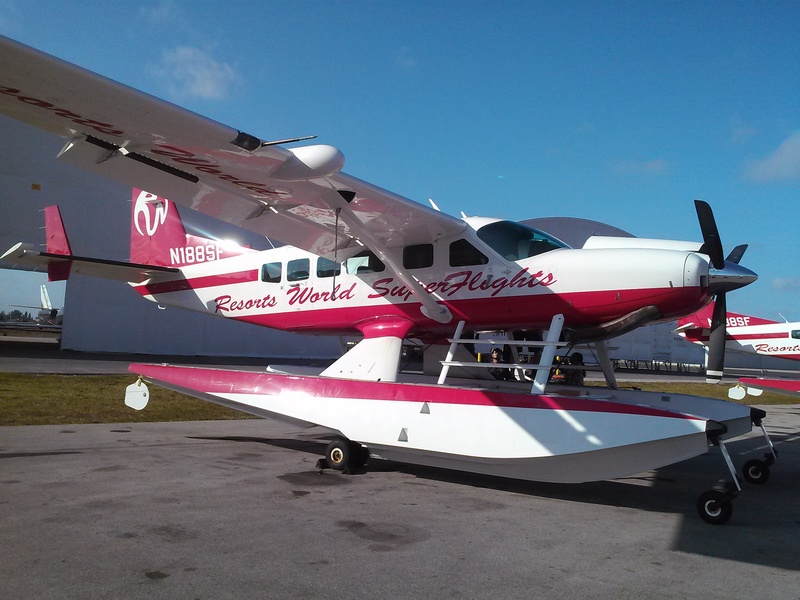 Not giving up on the Caribbean destination, I hopped onto Resorts World's amphibious plane to Bimini, taking in the luminous blue of the Caribbean Sea and the island's pristine beaches. By the time I sank my toes into the pearly sand and roamed around Resorts World's candy-colored cottages, I felt like I was an expert cruiser, having survived rogue waves and sleepless nights. PHOTO: Resorts World's amphibious plane. My experience was a fun adventure in hindsight, I felt like I had made deeper connections with my fellow travelers than I would have ever made and I had learned that I could withstand turbulent waves more than I had realized. It's not something I would choose to go through again but I actually felt I sense of accomplishment that I had managed to survive it. My cruise journey was filled with unexpected turns but my reward of finally landing on Bimini's peaceful shores made it totally worth it.